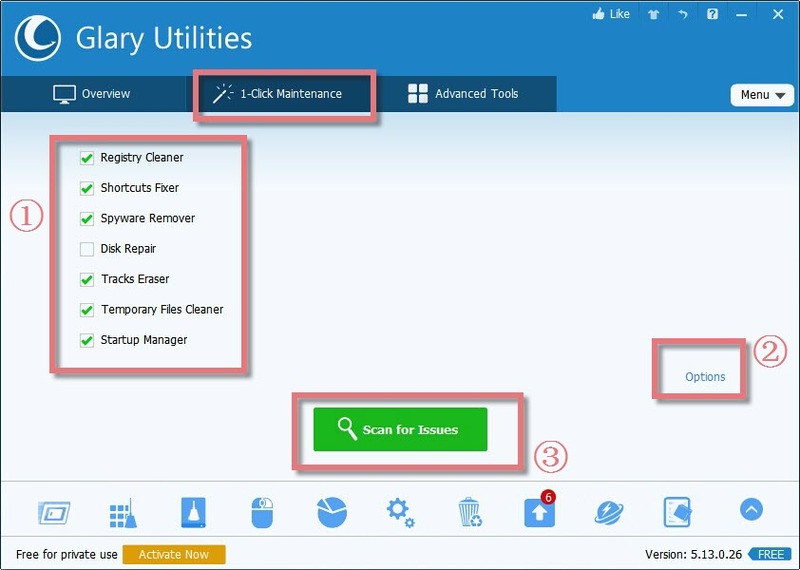 1-Click Maintenance allows you to perform even more thorough system checks and error correction with a single click. You can schedule it to run regularly to keep your system clean and without interrupting your work. 1. The Left Area: shows the features under 1-Click Maintenance. You can choose which feature you want to scan for issues. 2. Options Button: allows you to select the sections of each feature to scan. 3. Scan for Issues Button: after setup, you can click "Scan for Issues" to find out the issues on your PC, and then repair the problems. There are two ways to find the place to setup 1-Click Maintenance. You can find Options button on 1-Click Maintenance page, click Options, and then setup it in a new pop-up window. 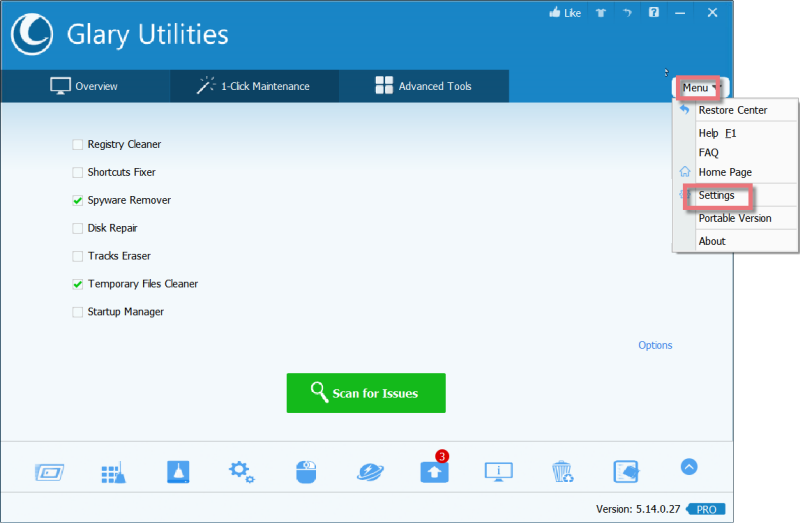 Or you can open Glary Utilities-> Click Menu icon on the top right -> Select Settings(the fifth button in Menu), you will also find the page to setup. On the page of Settings, you can choose the task under each feature you need to scan. 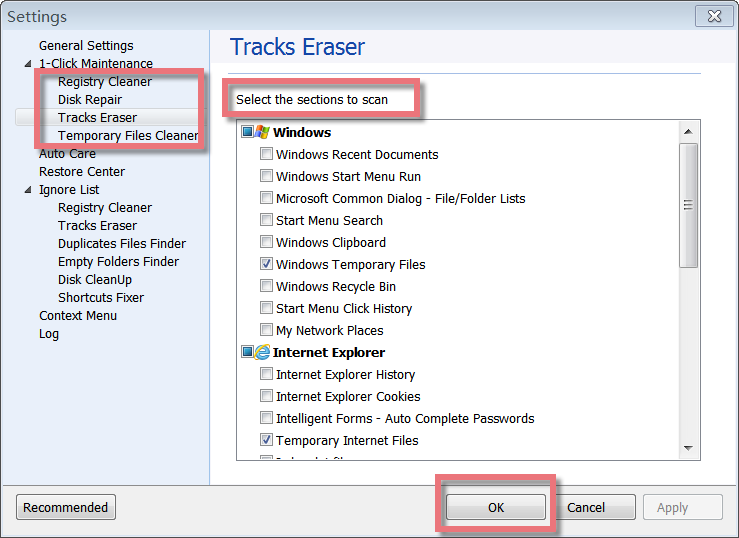 Here are four features on the left: Registry Cleaner, Disk Repair, Tracks Eraser and Temporary Files Cleaner. Click on each feature, you will see some tasks below this feature on the right box. Just checkup the box before each section you want to scan, and then click OK button. When you rescan issues for 1-Click Maintenance, these sections will be scanned. 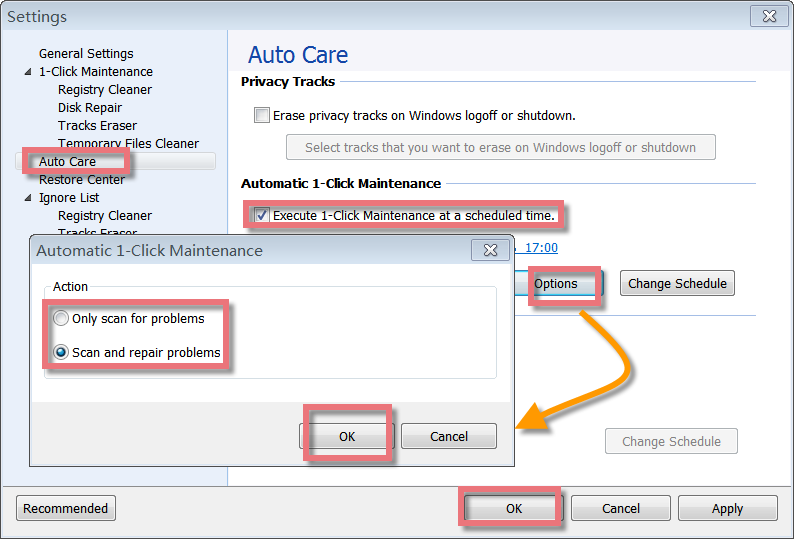 If you are using the pro version, you can schedule the time on executing automatic 1-Click Maintenance from "Auto Care". You can find the "Auto Care" from Settings in the Menu list. After you have marked the box before "Execute 1-Click Maintenance at a scheduled time. ", you can setup by "Options" button and "Change Schedule" button. "Options" button: allows you to setup 1-Click Maintenance to "only scan for problems" or "Scan and repair problems". Just remember to click "OK" button to finish the setup. "Change Schedule" button: allows you to schedule the date by daily, weekly and monthly from Monday to Sunday. You can edit the start time to any minutes you wish. There is also a power management. 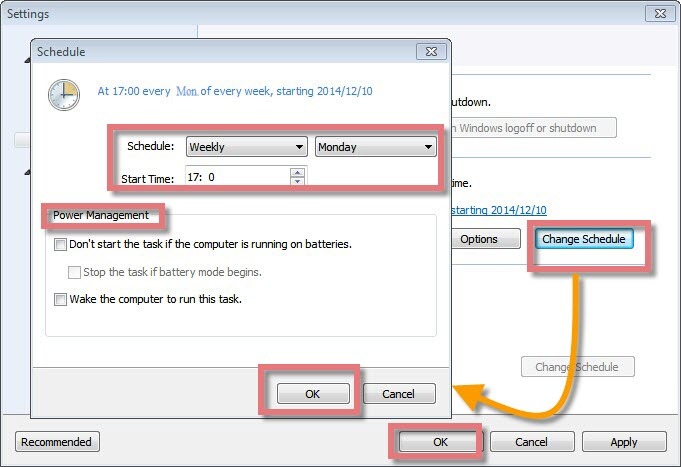 Through Power Management, you can choose "Don’t start the task if the computer is running on batteries" or "Wake the computer to run this task", finally click "OK" button to finish this schedule.